In an ideal world, business trips would always go ahead smoothly and as planned. The frustrating reality is this rarely happens. Delays and cancellations are a fact of life when you’re traveling by flight. Not only can these obstacles affect your perceived reliability and professionalism by making you late to important functions, but they can also greatly impact your mood. If you reach your destination late, stressed, guilty, and tired, you’re less likely to perform to the best of your ability. However, some airports are better than others when it comes to flight reliability. Some also have better amenities, faster Wi-Fi, and even perks like yoga studios. Hartsfield-Jackson Atlanta International Airport may be the busiest airport in the country, but it’s also remarkably reliable. According to research from Orbitz, almost 85 percent of flights from Hartsfield-Jackson leave on time. The airport also boasts 221 different stores and 100 different dining outlets, so you have plenty of ways to fill your time if your flighty does get delayed. If you’re running on fumes and you need to rest before a big meeting, try renting a private sleeping pod with a convertible sofa bed and a TV, which can be found on Concourse B. Hartsfield-Jackson also has a state of the art one-stop car rental facility, open 24 hours a day, seven days a week. Only 0.61 percent of flights from Seattle-Tacoma are canceled, according to Orbitz. That’s one of the lowest cancellation rates in the country. In the unlikely event that your flight is canceled, Seattle-Tacoma also has the fastest Wi-Fi speed of any airport in the US, so you can always remote in to your crucial meeting in a pinch — or harangue the airline on social media, if that is more your speed. Seattle-Tacoma also has two reasonably priced public lounges, so it’s easy to escape the crowds when you need to add those last minute touches to your presentation. While John F. Kennedy Airport is probably the most iconic airport in America, it doesn’t necessarily have the best record. Only 76 percent of JFK’s flights leave on time, and almost 3 percent end up getting canceled, according to Orbitz. However, those are better stats than many other airports, and JFK does have an impressive selection of amenities. With 148 different places to eat and more coffee shops than any other airport on this list, JFK ensures you’ll at least pass your delays in relative comfort. JFK also has an impressive number of private members-only lounges — 29 in total. Provided your company will pay for a subscription, you’ve got somewhere to retire and get some rest. Despite being located near Sin City, McCarran International Airport is pretty reliable: 81 percent of its flights leave on time, and less than 1 percent are canceled, according to Orbitz. If you’ve been crammed into a budget carrier for a few hours, or you need to clear your head before your meeting, Fly Fit provides walking paths in the airport’s terminals that range from half a mile to 1.5 miles. McCarran is also one of only two airports in the US with slot machines. If your pitch went badly — well, we’ll leave that up to you! O’Hare International Airport is the fifth busiest airport in the world, and it has a relatively good flight record, with 79 percent leaving on time, according to Orbitz. If the worst does happen, business travelers can take advantage of the airport’s relaxation facilities, including a yoga room and a spa. Even if you’re inwardly livid, your colleagues will never know after you’ve hit the sauna. It goes without saying that delays and cancelations are the most infuriating aspect of any trip, but this is especially true during high-stakes business trips. You’re more likely to make a good impression if you reach your destination on time and with minimal frustration. 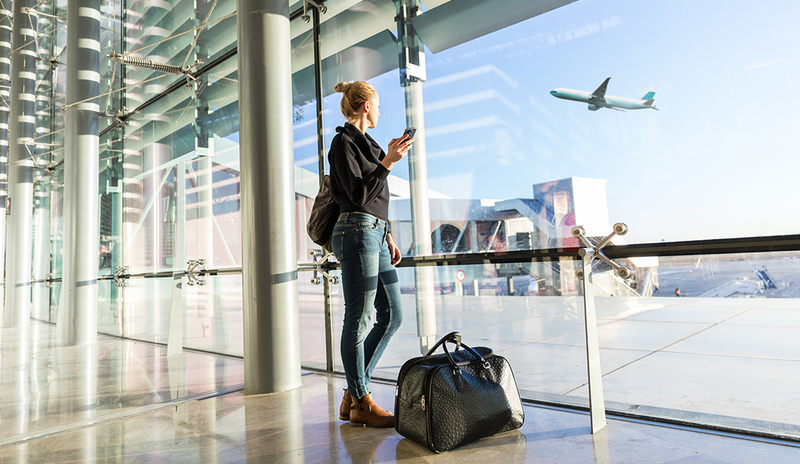 If you can make it work, definitely try flying from one of these airports the next time you have to travel for business. Irma Hunkeler works for Re:signal, a digital marketing agency.